Direct mail seems to be a thing of the past. But it isn't and it still works. In fact, it outperforms digital marketing by a staggering 600%. The total mail volume attributed to direct mail has grown year by year, making up a whopping 57% of mail in 2014 (page 71 of the DMA Statistical Fact Book). The companies sending direct mail are tapped in to its powerful benefits that other channels like social and email can't provide on their own. They understand that with better targeting, direct mail is well worth the investment, boasting a 4.4% response rate in comparison to email's 0.12% response rate (according to Direct Marketing News). There are lots of direct mail options for growing your business. You can stay with tried and true formats, or branch out into more unique pieces to get even more attention. 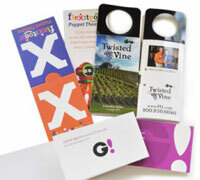 You can also add different attributes to your direct mail piece to increase engagement and drive better results. Postcards have been in use for a long time, and they stick around for a reason–they work. These small, flat mailers are a budget friendly solution for small businesses looking to try direct mail marketing. Don't let the low cost make you think postcards aren't high dollar enough to get the job done. Among all types of mail pieces, postcards are the most likely to be read, with 51% of all recipients reading them (page 73 of the DMA Statistical Fact Book). Simple tweaks like special effects or a well-crafted message can take your postcards to the next level to increase engagement rate and response. 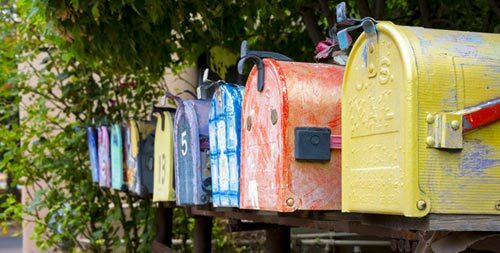 Every Door Direct Mail, or EDDM, is a United States Postal Service program that allows you to have flat mailers delivered to specific neighborhoods using carrier routes. You don't need to have a list of these addresses, you just choose a route and the US Post Office delivers your mailers to every house or business (or both) on the route. EDDM is great for local businesses like retail, health clinics, restaurants, real estate, or any other business with a broad enough offering to appeal to entire portions of your local community. You can select who to target based on residence type, median income, age and more to make sure your offer reaches the right audience. While postcards are a great option, there are some other distinct printed pieces that really grab the attention of potential customers. One of the most unique options you have are door hangers. Door hangers are exactly what they sound like, a piece of advertising for your business that hangs from a potential customer's door. Door hangers never go into the mailbox, so they aren't shuffled in with the other direct mail pieces. They really standout–you simply can't ignore them. They are so effective they run the risk of upsetting some customers - so make them relevant. One popular use is to print coupons on the door hanger. They are great for restaurants or local retailers targeting a specific geographical area. When you think direct mail, stickers and magnets may not immediately come to mind. But they're some of the most appreciated print pieces your customers can get. What makes products like these so valuable is their staying power. While postcards and flyers are great, they get tossed quickly. Magnets, however, get put on a fridge and seen every time your potential customer goes to grab the milk. This is extremely important as most potential customers need to be exposed to your brand at least seven times before they can recall it. Stickers pose the same benefits. Not only do these having staying power, they're interactive. As the recipient peels the plastic layer off the back and decides which item to adorn with the sticker, they're having an experience with your brand. The power of direct mail lies in the form itself. Every fold and fiber creates a tangible experience that makes more of an impact than skimming an email on a screen. Marketers call this sensory marketing. It's the art of tapping into a person's senses to create an experience. The more senses you can engage, the more powerful the experience. While email and social are convenient, they only access a person's visuals. Direct mail, on the other hand (quite literally) stimulates a person's sense of sight, touch, and hearing. If you go the extra mile with scented inks, you can even engage their sense of smell. Talk about an all-encompassing brand experience. Custom print effects like metallic inks or scratch-off interactions are a great way to get your print piece noticed and rise above the competition. You can choose from an array of effects to create a distinct mailer. This can be as simple as a custom fold that elevates your piece above a flat mailer, or a die cut that creates custom shapes instead of a standard straight edge. Some of the most popular custom effects today are foil printing and embossing. These effects communicate a fresh, modern feel and an understanding of contemporary design. You can learn more about all of these custom print features here. No matter which pieces you choose, direct mail is marketing your customers will find hard to ignore. It demands interaction. If designed well, it stands out in a sea of digital noise. When you are ready to grow your business with direct mail, PFL can help. Put our 20 years of experience to work for you!